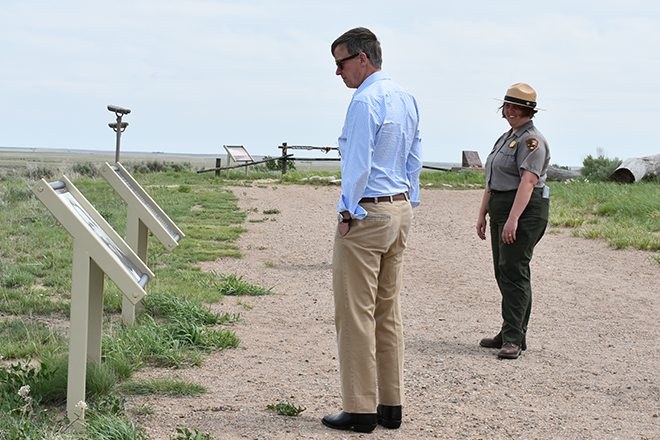 Colorado Governor John Hickenlooper visited the Sand Creek Massacre National Historic Site in Kiowa County Wednesday to pay respects to those who died in the 1864 attack led by Colorado U.S. Volunteer Cavalry led by Colonel John Chivington. Peaceful Cheyenne and Arapaho native Americans were camped at the location and received assurances they would not be harmed. Instead, Chivington's attack left 230 people dead, more than half of whom were women and children. 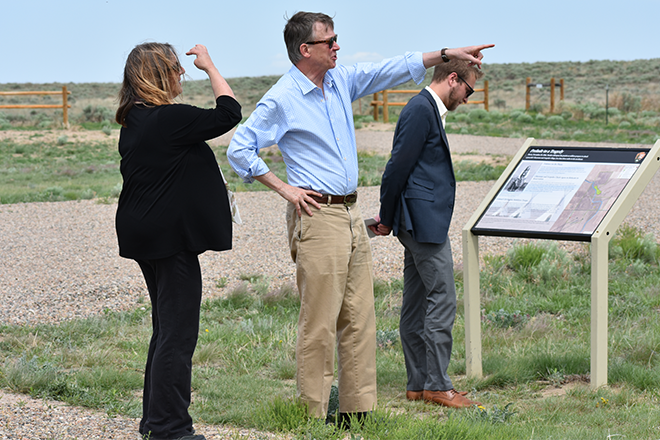 The governor's tour included an overview of the history of the site, as well as updates from National Park Service staff about continuing efforts to preserve and enhance Sand Creek's educational opportunities. In addition to the park location, an historic building in nearby Eads is being renovated to serve as a research and learning center focused on the events at Sand Creek. Efforts are also underway to form a non-profit foundation to support the learning center. 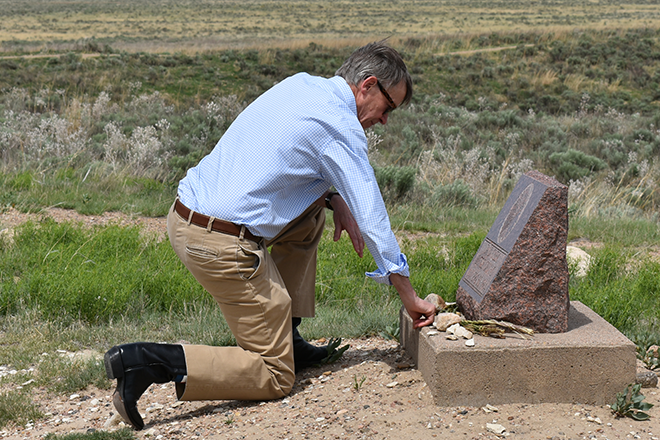 Governor Hickenlooper placed a braid of sweet grass at a monument to honor those who died at the site. 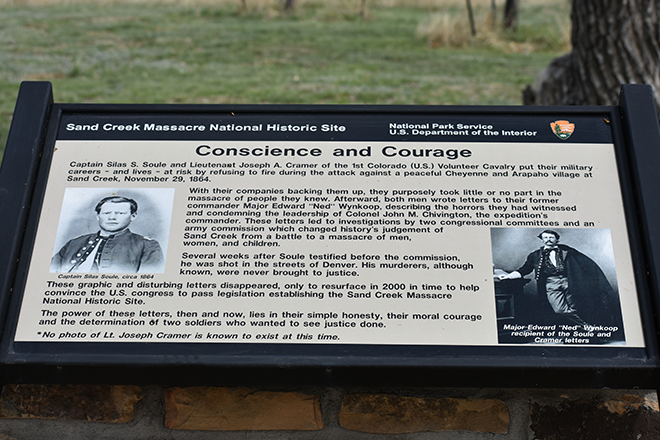 NPS opened the Sand Creek Massacre site to the public in 2007 after a multi-year effort to acquire the property and have it designated as a national historic site. To the extent possible, the location is being returned to how it would have appeared more than 150 years ago. Most buildings and other items have been removed. Interpretive signs have been installed, and park rangers provide guided tours and answer questions. While at the site, Governor Hickenlooper agreed to record a short video in which he will call out the importance of completing the facilities. He joins other political figures in a bipartisan effort to draw attention to the history of the area. The governor noted that his great grandfather, Andrew Hickenlooper, served in the Union Army with Brevet Major General George Custer. Custer went on to lead an infamous battle with native Americans at Little Bighorn, Montana, in 1876. He died during the fighting. Sand Creek has about 7,000 visitors each year, including 1,200 students. Boy and Girl Scouts have been assisting with projects including restoring vegetation. Over the Memorial Day weekend, the park will be hosting a guided walk, which will begin at 10:00 a.m. Saturday, May 26. See the map below for direction to reach the site. The Sand Creek Massacre National Historic Site is open from 9:00 a.m. to 4:00 p.m. daily through November. Entrance is free. Update - a previous version of this article mis-identified George Custer's rank.